The first image which appears in my mind when the word “Lagoon” is stated would be the luxury catamaran. I found Lagoon catamaran sailing yachts very popular lately, among private yacht owners as well as among those who use to charter yachts for their holidays. Spacious, luxurious, quality, even fancy and glamorous; those would be words used to describe Lagoons. Some critics would grumble about their robust appearance, the lack of elegance or poor sailing performances, but everyone would agree that those vessels have their committed audience. The recent edition of Cannes Yachting Festival was the occasion for world premiere of Lagoon 630 Motor Yacht. At first glance, this baby looks just like any other Lagoon catamaran sailing yacht. Still, when you take a better look at her, you have the feeling that something is missing. You are right; there is no mast and sails! After the initial shock you realize that you are standing on board a luxury and stylish vessel. 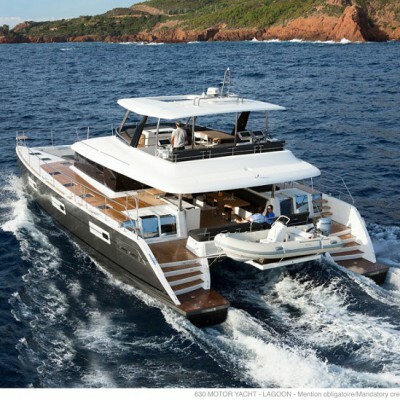 Lagoon 630 MY was born as a result of cooperation between Lagoon teams, Van Peteghem-Lauriot Prévost naval architects’ studio and the Nauta Design studio. Their goal was to step into the competitive market of motor yachts, using their own knowledge and achievements. 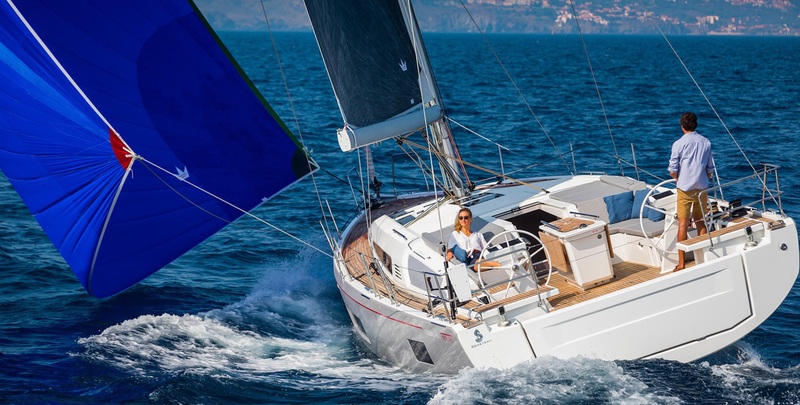 So, Lagoon 630 MY was built on the basis of successful sailing yacht catamaran Lagoon 620, which was declared world’s best seller in its category. The underwater hulls were slightly modified in order to maintain a small longitudinal trim incidence which resulted in obtaining 12 knots cruising speed and 15 knots maximum speed of the vessel using two Volvo D4-240 engines which release power of 240 HP. The keels were also removed in order to increase maneuverability while other modifications were aimed to reduce wake behind the vessel and increase fuel efficiency. More or less that would be all about technical modifications about the existing hull. The rest of the job was done by the interior and exterior space designers who intended to make Lagoon 630 MY ultimately stylish and comfortable. The deck remained more or less the same as the one of sailing yacht while the flybridge is totally new. There are re-designed command positions on both sides astern of the flybridge platform. As well as the sailing yacht version, the Lagoon 630 MY comes with various interior design options – with 4, 5 or 6 cabins; with central or lateral galley while the chart table is always placed in the central position in the front of the saloon. The cockpit is connected to the saloon with sliding doors and windows making living aboard a combination between outdoor and indoor. Large storage areas, as well as numerous refrigerators, kitchen equipment and luxury bathroom and bedroom equipment are all designed with regard to elegance, feeling of natural materials and ergonomics. I would recommend the use of Lagoon 630 MY for not very long coastal trips, but the data on fuel efficiency and diesel tanks capacity of 3000 l should guarantee safe long legged trips as well. My next doubt is about the comfort and stability under way since catamarans could be very unpleasant on rough sea. However, the advocates of catamarans claim that those vessels have superior stability than monohulls, but that discussion belongs to another place and time. At the end of the day, there is no doubt that this 19.3 m long and 10 m wide vessel takes the Lagoon company into the new world of luxury vessels. Their success has already been predicted by the first who took the trial trip at this year’s Cannes Yachting Festival. 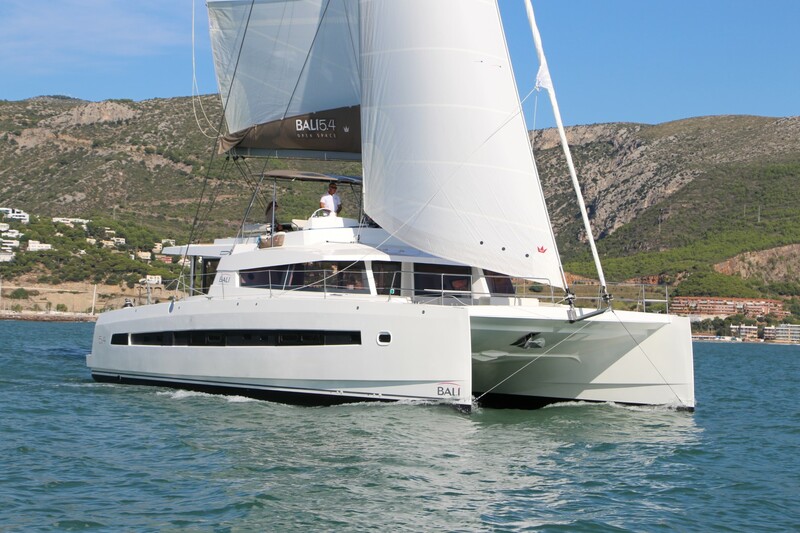 For more charter catamarans visit our site Sailing Catamaran Yachts and check out the top charter spots and special offers section.